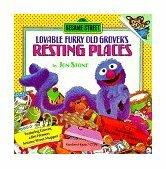 By Jon Stone Starring loveable, furry old Grover! What did that say? On the cover, what did that say? Did that say there will be a monster at the end of this book? IT DID? Oh, I am so scared of monsters!!! Lovable, furry old Grover is distressed to learn that there's a monster at the end of this book! He begs readers not to turn the pages, but of course kids feel they just have to see this monster for themselves. Grover is astonished -— and kids are delighted -— to discover who is really the monster at the end of the book! 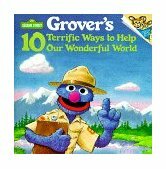 The classic Grover book is available once again. 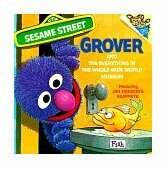 In a style similar to Would You Like to Play Hide & Seek in this Book With Lovable Furry Old Grover, Grover hears a that there is a monster at the end of the book. He pleds with the reader not to turn the pages and even tries to build barriers to prevent the page from being turned. Of course, that only encourages children to want to turn the pages even more! This unique story in which the book itself is a part of the setting makes for an engaging read for adults and children. (Board Book) In this sequel to The Monster at the End of this Book, furry old Grover is still fearful of monsters -- and he learns that there's another one at the end of this book! Just who is the monster at the end of this book? This is a wonderful book for children who can't get enough of the original The Monster at the End of this Book. 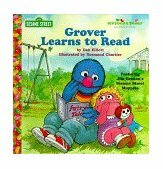 This time, Grover again pleads with readers not to turn the page, while Elmo encourages readers to keep going. The idea is the same. Grover again tries to (unsuccessfully) block the pages from being turned. This book is in board book format, making it very accessible to the youngest readers. By Jon Stone In honor of the 35th Anniversary of Sesame Street, Random House is re-releasing its classic The Monster at the End of this Book. There is a twist, however. This version features pop-ups, flaps, and other interactive treats to keep children involved in the story. A warning for parents of young children, however -- the flaps and pop-ups will not survive the "toddler treatment". Preschoolers on the other hand will love it! By Anna Jane Hays Lovable old Grover bends over backward to show you the letters A through Z! He uses his own furry little blue body to create his very own alphabet. By Anna Ross Little Grover can't stop to play as he hurries home: he has to go. His mommy understands, and she accompanies him to the bathroom, where he goes all by himself. By Abigail Tabby In the cart I have a seat. We buy healthy things to eat! Even the youngest children go grocery shopping with grown-ups and sit in the front seat of the shopping cart. Very brief, rhyming text and Baby Grover introduce this universal experience for babies and toddlers. By Sarah Albee Everybody’s favorite blue monster, Grover, gives readers his top ten rules of pet care. With a mix of seriousness and humor, Grover covers the basics, such as feeding, exercising, and grooming a family pet. With hilarious illustrations and appearances by all the Sesame Street characters, this book is nonstop fun! By Anne Duax Tying in to an exciting new segment on the show, Global Grover travels to destinations across the world. Kids will love the adventure, simple activities, and fun coloring pages. On the back cover are two cutout postcards. Children can write or draw something about their imaginary voyages and send these cards to friends. By Jon Stone When elbows, thumbs, ears, and even belly buttons get tired, Grover has the perfect solution: a resting place for each part of the body. He invites children to try them out by placing their own elbows, etc., right on the shapes indicated on the pages of this imaginative book. 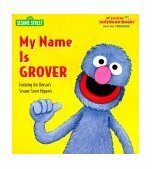 By R. Koeppel Sesame Street favorite, lovable Grover introduces letter "B" in a colorful book to help young children learn the alphabet. Color illustrations throughout. By Constance Allen Everyone’s favorite furry blue pal Grover uses some wacky situations to illustrate and explain the rudiments of good manners. By Norman Gorbaty When the sun goes down, Little Grover puts all his toys away, brushes his teeth and snuggles down to dreamland. By Tom Cooke For every different thing that Grover does, he wears a different hat. He is an astronaut, a fireman, and a baseball player all in one day! 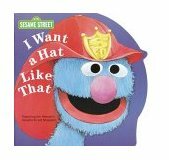 Whether it's a fire fighter's hat, a baseball cap, or an astronaut's helmet--Grover wants a hat like that! By Dan Elliott Grover loves having his mommy read to him. So when he starts learning how to read in school, he begins to worry. He wants to be able to read, but what if his mommy doesn't read to him anymore? A charming story that offers simple reassurances to children as they make their way through one of life's most important passages: learning how to read. By Deborah Hautzig Grover feels like a failure because he can't think of the perfect present to give his mother on Mother's Day. What he doesn't realize is that he's already given her the best present: himself! By Tish Rabe Grover writes a poem that tells about himself and the things he likes to do on Sesame Street. By Carol Nicklaus Little readers will love to scrubby-dubby in the tubby with Grover, until--oh, goodness!--it's time for bed. Made of sturdy vinyl to withstand gallons of soapy water, this bathtime treat is guaranteed to make young bathers bubble over with delight. Grover, Grover, Come on Over! By Katharine K. Ross & Tom Cooke Grover can't come over because he's busy working on a secret recycling project. 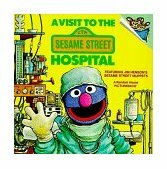 Young readers can unravel the mystery as Grover enlists the help of Elmo, Betty Lou, Bert and Herry to make his idea fly. By Anna Ross A jam-packed amalgam of puzzles, experiments, optical illusions, secret codes, and more are clearly explained in this brain-boggling activity book. Every puzzle, trick, and project can be executed with safe, inexpensive materials found around the home and the lively step-by-step instructions make each activity easy to follow. By Dan Elliott Grover visits the hospital to find out what to expect when he goes to have his tonsils out. 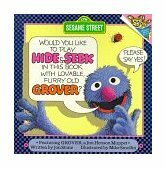 Would You Like to Play Hide & Seek in This Book With Lovable, Furry Old Grover? By Jon Stone Featured words on each page help the reader find Grover's hiding places during a game of hide-and-seek. By Norman Stiles The fuzzy Sesame Street puppet tours The Small Hall, The Carrot Room, and other unusual exhibits in a unique museum. MonsterTales : Is There a Monster in the House? Exploring a spooky mansion that is hilariously haunted, a very nervous Grover moves from room to room and finds a very silly collection of monsters, including himself. (Book PLUS Audio Cassette) Grover and Elmo team up to present some of the zaniest and loudest colors on Sesame Street. Clear the way for a growling yellow bulldozer, a squealing pink pig, popping purple balloons, and plenty more! By Tom Brannon Be sure to buckle up--especially in outer space! Officer Grover and Safety Deputy Elmo share important safety tips. Whether in the house or far away from home, Grover and Elmo know how to stay safe. By the end of the story, readers will be ready for their own safety deputy stars!